Shirley Raines, EdD, served as president of the University of Memphis and was the first woman to hold that position. She is now president emerita and spends her time speaking, consulting, training, and writing. Previously she was the vice chancellor for cademic services and dean of the College of Education at the University of Kentucky in Lexington. She is a former classroom teacher, Head Start director, and childcare-center director. Raines holds a doctorate in education from the University of Tennessee in Knoxville, where she also earned her MS degree. Raines has served on the faculty or administration of universities in Florida, Virginia, Oklahoma, North Carolina, and Alabama. 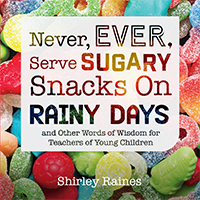 First published more than 20 years ago, this warm and witty collection of advice has been updated to inspire the teachers of today. Teaching is a challenging job, but it is so worthwhile. Let the teachers in your life know how much you appreciate all that they do!